DVD Synopsis: Legendary director Ingmar Bergman creates a testament to the strength of the soul – and a film of absolute power. Karin and Maria come to the aid of their dying sister, Agnes, but jealousy, manipulation, and selfishness come before empathy. Agnes, torch red by cancer, transcends the pettiness of her sisters' concerns to remember moments of being – moments that Bergman, with the help of Academy Award-winning cinematographer Sven Nykvist, translates into pictures of staggering beauty and unfathomable horror. Ingmar Bergman’s deeply dramatic tale of life and death, Cries and Whispers is filled to the breaking point with devastating revelations. Appropriately titled, it's the story of four women (three of whom are sisters) who long to cry out, yet, in the end, can only muster soft, ineffective whispers. Bergman, who always showed a talent for directing women, is able to generate performances from his leads that are nothing short of remarkable. Trapped in a loveless marriage, Karin (Ingrid Thulin), the eldest sister, believes herself incapable of experiencing emotions of any kind, and as a result is direct and unflinching in her approach to everything. Maria (Liv Ullmann), the youngest of the three siblings, is the exact opposite, an outgoing and vibrant woman, yet one whose carefree personality masks a deeply selfish, closed existence. Harriet Andersson delivers the films most powerful performance as Agnes, the sister who’s dying rapidly. Her pain is devastating, and her cries of agony emanate throughout this entire film, yet we come to learn that her suffering has not been entirely in vain. In fact, it has provided Agnes the opportunity to finally reflect on her life, helping her to mature emotionally in ways her sisters never have. Kari Sylwan’s Anna, the house servant who lost her own young daughter to illness years earlier, is Agnes’ sister in spirit, if not blood. Through it all, Anna maintains a strong faith in both God and life, even while surrounded on all sides by death and decay. Cries and Whispers is stunningly photographed by longtime Bergman collaborator, Sven Nykvist, who floods the screen, from start to finish, with the bright color of red, meant to signify (in my opinion, anyway) a bleeding of sorts. The color serves as the symbolic torment that these characters endure throughout the film, not the result of any physical affliction, mind you, but a wounding of the soul. Anna has loved and lost, whereas Karin and Maria have lost without ever knowing love. Perhaps most tragically of all, Agnes, at the end of her life, has only now experienced both. Agnes' struggles at the end of her life are the most realistic I've seen on film, for that illness. Hard to watch. @joem18b: Thanks for the comment! I absolutely agree...These scenes are devastating to watch. I've never seen this. Of Bergman's films, I've only seen THE VIRGIN SPRING and THE SEVENTH SEAL. Excellent review though. I can see what you meant about the use of red from the trailer alone. It seems to be a beautiful, haunting picture and. I'll be adding it to my "must watch" list! Joel: Thanks for the comment! 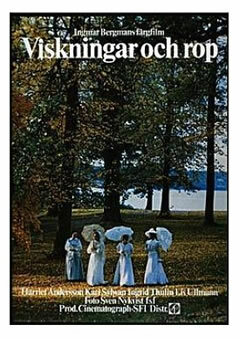 I would definitely rank CRIES AND WHISPERS among Bergman's finest, and I think you'll be impressed. Please be sure to stop back after you see it! I'm a fan of both THE VIRGIN SPRING (which, surprisingly, was a heavy influence on Wes Craven's LAST HOUSE ON THE LEFT) and, of course, THE SEVENTH SEAL. Two more I would highly recommend are FANNY AND ALEXANDER and SMILES OF A SUMMER NIGHT. Thanks again, and I hope to talk to you soon!